Anguilla, a Brittish Overseas Territory, is a fantastic island. It has a reputation among the cruising world as being expensive, and while that can be true, there are ways to limit the expense and it is certainly worth it. We'd sure like to come back and visit a lot more. 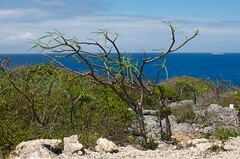 After spending a day exploring one of the outer Cays (Prickly Pear Cay) we decided to rent a car and tour the island. 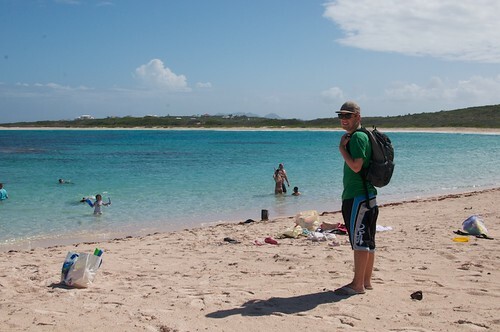 Anguilla is a popular spot for the more wealthy so it has more than its fare share of resorts. They are all fairly small and private and expensive so we decided to try and find a more low key, remote pace to go for the day. Looking at the road map the north east end of the island looked promising as it only had one small resort, a beach bar and several remote beaches. Off we went, stopping at grocery stores for lunch snacks along the way. The seven seater van we rented claimed to have AC but it only "worked" if we had the windows down. And it was a hot day. Hmmm. We wind our way to the end of the island's paved roads then shift to a partially paved road about the width of a car but still two directions of traffic. Then the road starts getting really rough. We bounce and twist our way over this coral/lime road until it ends overlooking a point of rocks and desert brush. Oops, wrong turn. Us: "Hi there. We're looking for Savannah Bay." Guys in jeep: "OK. Great spot. Do you have a Jeep?" Guys in jeep: "An SUV?" Guys in jeep: "A minivan?" Guys in jeep: "Is it a rental?" Guys in jeep: "OK, no problem then. Just follow the road that has the telephone poles, about a mile past the broken down bulldozer until you come to a rubble barricade then turn down the the little path to the right then go about another 1/4 mile until you come to the water. Easy." It turns out those were the directions to the wrong beach. Luckily for us we figured that out fairly quickly and found the correct road which happened to be much smoother and less of a 4x4 trail! And at the end of the road we found a very nice, nearly private beach. Definitely a spot to come back to some day.